It is possible to buy affordable quality used vehicles from auctions in different cities in South Africa. There are often bank repossessed auctions taking place in Cape Town and Gauteng among many other places in the country, so this is where you need to be if you are looking for 2nd hand cars for sale at good prices. Repossessions offer you decent cars at affordable prices and although many people are not interested in repossessions, it is because they haven’t had the chance to experience it. Some bank repossessed cars are in bad condition and sold at next to nothing, so if you’d like to build up your own vehicle, then that’s when you can do too. Buying a used car from a dealership can be a bit daunting, especially if you are inexperienced and have limited finances. In this case, it is a good idea to do a bit of research first, and get as much information as possible, to help you buy that car that you want so badly, at a price that you can afford, with as few problems as possible. No amount of negotiating tips will help you, if you do not know exactly how much you want to pay for the car that you want to buy. Before approaching the dealership, it is very important that you know what type of vehicle you want to buy, and what you are prepared to pay for it. You more than likely have a car in mind that you want to purchase, so before going to the dealership, do some homework, and find out all the information you can about the car, such as how old it is, what condition it is in, safety equipment, mileage, and everything else necessary, that would affect the price of the used car. When purchasing a used vehicle, you will have more negotiating power if you seem a little uninterested in what the car dealer is offering you. The dealer is going to do everything in his power to make a sale, and will try everything to convince you to buy the car. If you act uninterested, and let him feel that you are more than happy to look elsewhere, his attitude will change immediately, and he will probably make you a better offer. You are a potential customer, and there is stiff competition out there, so the dealer will try anything, even lower the price of the car, just to make the sale. Compromising too much, is one of the common mistakes that many people make when buying a used vehicle. This happens when too much focus is put on the amount that you can afford to pay each month, so don’t under any circumstances, tell the salesman what you can afford. You should know beforehand what the car is worth, and what you can afford to pay each month. These should only be discussed when a final price has been agreed upon. Stick to the price that you want to pay, and don’t back down. You are the client, and he wants to sell the car to you, which means that you are in charge. 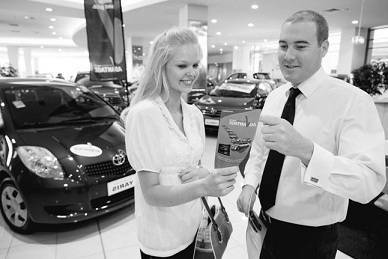 Nothing gets through to a car dealer as to how serious you are, like when you greet him, and walk out of the showroom. You have told him what you want to pay, and what you can afford, and if he is not prepared to meet your terms, then tell him that you will look elsewhere. The message that you are conveying to him, is that you are the customer, and if he wants your money, then he must do so according to your terms. Leave your contact details with the dealership, to give them the opportunity to think things over. If they do not contact you in the next few days with a deal that suits your needs, then it’s best to find a car at another dealership. Even though you’re an inexperienced used car buyer, and have your heart set on a certain car, don’t be impulsive and buy that particular vehicle without thinking carefully about it first. Use the Internet to your advantage, and shop around for a while. There is a good chance than you might find something better this way, at an even better price than what you were prepared to pay. Alternatively, visit used car lots after hours, where you can browse through the used cars that are available, without having to speak to a salesman. Make notes of the cars that you are interested in, and then go home, and do your research for the information you need, in the comfort of your own home. Knowing exactly what you want, and how much you want to pay, will give you more confidence when talking to the salesman about that car of your dreams. There are many different venues in Cape Town where you can buy affordable quality used vehicles and the same goes for those who are in Gauteng, the 2nd hand cars for sale are available in many different models so you are sure to find exactly what you are looking for. Not everyone in South Africa is able to purchase a brand new car, so this is where they will visit a bank auction and see what they can find there. Even if for some reason you don’t find the car you really wanted, there will be loads of other vehicles that you can choose from, otherwise visit another auction and see if they don’t have something you like. Even if you don’t have the funds available, many auction events have financing that you can make use of if you need to. If you are not keen on making a loan, you should make sure you have enough money before you visit an auction, even if it means saving up some cash for a few months before going.